People often ask me what they should see when visiting Rome. In a city with this much history, choosing how to spend your time can seem pretty overwhelming, but in reality, the must-see tourist sights are fairly condensed in the centre of Rome, making them very do-able within three days. The combined ticket to the Coliseum and the nearby forums costs € 12,00, and is valid for two days. If you’re short on time, you can do both in one day, taking about an hour to wander the Coliseum in the early morning, and the rest of the day to explore the maze of palaces, tombs, and basilicas in the forums. If you want to survive your trip to Rome…do not eat at these trucks! The Coliseum is currently getting a makeover, which has included the installation of some flashy new signs to give you background information on the structure. However, you will want a guidebook while in the forums in order to enjoy it to its fullest. If you’re spending all day here, then pack a lunch to avoid risking food poisoning at the food trucks that descend on the area. Have dinner at the Taverna dei Fori Imperiali (you will need a reservation!). While you’re there, you can take a stroll around the picturesque neighborhood of Monti. The Pantheon is free to enter, and open from 9AM to 7:30PM (6PM on Sunday). Spend a while wandering around the spectacular building, in awe of its mysterious construction (it was completed some 2,000 years ago). The original use of the Pantheon is uncertain, though it is suspected that it was the temple to the whole host of gods who may not have had a temple dedicated to them individually. The structure was later used as a Christian church, and hosts the tomb of the artist and architect Raphael. Roman legend has it that the church was constructed on top of a mound of dirt with coins hidden throughout it. Then, the story says, once construction was completed, the Roman populace was called to dig out the dirt from the inside, hunting for buried treasure. After the Pantheon, stop in for a gelato at Giolitti, a gastronomic must-eat of Rome (though not my favorite gelato place). You can then make your way over to Piazza Navona to see the Fontana dei Quattro Fiumi (Fountain of Four Rivers) by sculptor Bernini. Then head towards Via del Corso, Rome’s main shopping street, and wander through Piazza di Spagna. Me at 18 (without tattoos!) 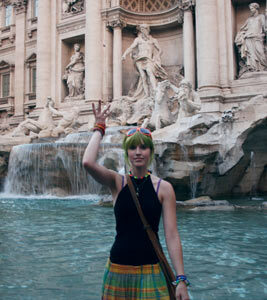 tossing a euro into the Trevi fountain, hoping desperately to come back soon to Rome. It seems that my investment paid off. Admire my favorite fountain (Fontana della Barcaccia), which depicts a sinking ship (it was also sculpted by Bernini), as well as the Spanish Steps leading up to the Spanish Embassy. Finally, make your way to Piazza del Popolo, and climb up the Pincio for a beautiful view of Rome. If you feel up for it head towards the Fountain of Trevi, famous for the legend of the coin toss – that throwing a coin backwards over your shoulder ensures that you will one day return to Rome. The best time to see this one is after midnight, when the hordes of tourists have cleared out so that you can actually appreciate the beauty of the fountain without being hit in the eye by errant coins chucked over someone’s shoulder. The Trevi Fountain also appeared in La Dolce Vita as Marcello Mastroiani’s character (Marcello) splashes around in the fountain with the air-headed Sylvia. Careful that you don’t try to duplicate the scene – this is one of the only things the notoriously lax Roman police actually ticket tourists for. 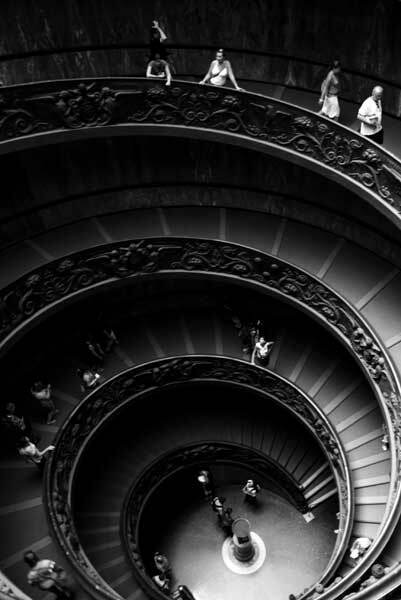 The famous spiral staircase which leads you out of the Vatican Museums. 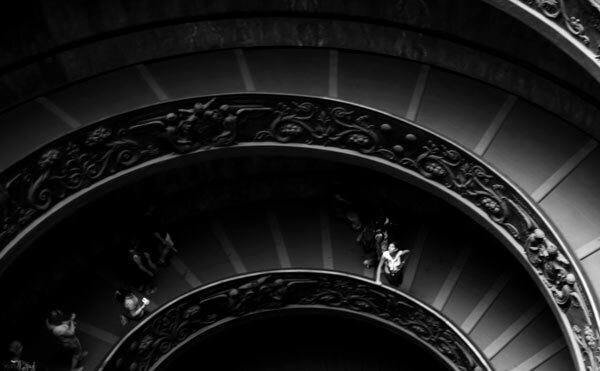 In order to see the Sistine Chapel, you will have to make your way through the winding art-filled corridors of the Vatican Museums. On busy days you can wait up to two hours for admission to the museum, so arrive early or pay extra to skip the line. If you walk very very quickly (and the place isn’t packed with tourists) getting through the museum will still take you another couple hours, as you are forced to follow the entire path through the museum to its end at the Sistine Chapel. The Vatican’s art collection is impressive, though arranged in a fairly senseless manner. You’ll see Etruscan art, an Egyptian mummy, works by Dali and Van Gogh, and an entire room filled with statues of animals. There is so much art crammed into every room that it can be a bit overwhelming, so be on the lookout for some of the more impressive pieces and spend your time admiring them. I personally like Raphael’s rooms, the gallery of maps (you’ll know it when you see it), and the statue of Laocoon and his sons (ok, and I actually really love the animal-statue-room though I find it a bit ridiculous that these statues are on display when the Vatican has an entire underground catalog of famous art that no one has ever seen). By the way, can someone tell me why it is that I can’t find a single source to back up any of the nasty things I hear about the Vatican from literally every long-time resident of Rome? Someone please find me a website about the part of the Vatican’s art collection not on display in the museum. 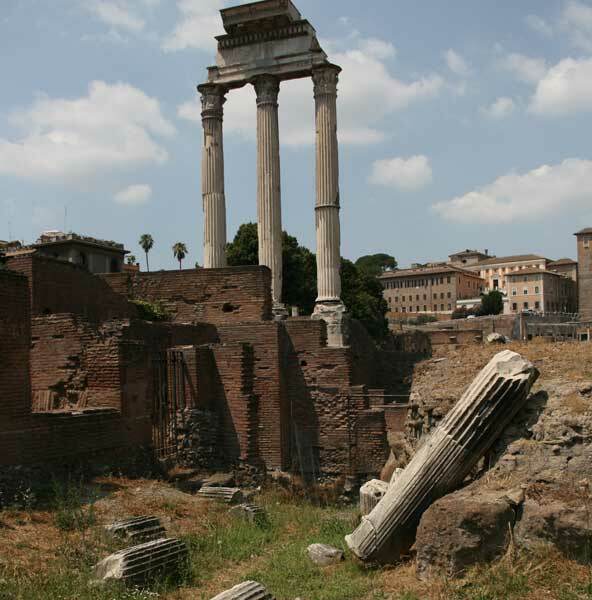 After you’ve escaped the chaos of the museum, head over to the nearby Basilica of Saint Peter. Find a spot among the crowd and admire Michelangelo’s Pieta for a while. Then you can stroll through the extravagant church as long as you can stand while knowing that most of the marble was pulled from the Roman forums (again, someone please find me internet evidence!). For 5 Euros you can climb the winding stairs to the top of the dome (or pay an extra two to take an elevator part of the way). To finish off your day, wander around in Trastevere and stop for pizza and Italian craft beer at Bir & Fud (call a day in advance if you want any hope of getting a reservation). You can follow my jam-packed itinerary, or split the sights up into several extra more relaxed days. Personally, I would see these sights in your first few days and then check out some of Rome’s less well-known, “off-the-beaten-path” sort of attractions, or take a day trip to one of the strange and beautiful places nearby.